There are many advantages to buying a home in Omaha. Many of our clients look forward to the little things, like being able to remodel or redecorate without having to ask someone else for permission. Others look forward to the feeling of really putting down roots in a community. However, what most of our clients don’t realize is there are real financial benefits of owning a home. We went ahead and crunched the numbers for you based on the average home price in Omaha, current interest rates, forecasted home appreciation rates for Douglas County, and more. If you’re not a numbers person, feel free to skim over the next section. 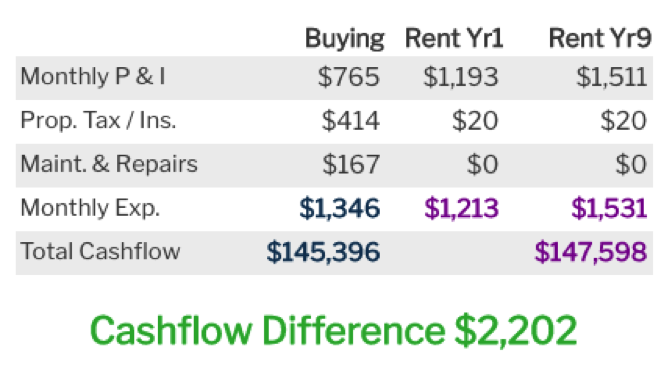 Based on the numbers above, buying will save you $2,202 in cashflow alone. 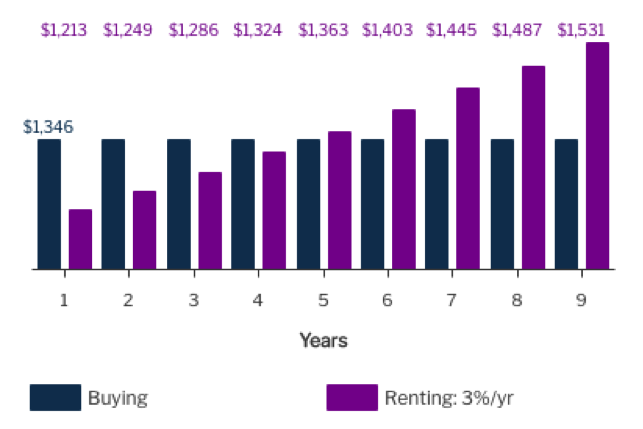 As you can see below, over the course of 9 years you would spend $145,396 on housing expenses as opposed to the $147,598 you would spend to rent. In addition to saving cash, based on the forecasted appreciation rate your $163,000 home would be worth $195,593 after 9 years. That’s an increased value of $32,593! And don’t forget about your equity. At the end of 9 years, your remaining principal balance would be $121,888. Meaning, you’ve built $24,812 of equity in just 9 years! That’s right – in just 9 years, you gained $40,871 from buying a home in Omaha rather than renting one. Buying is like investing early…but better. Say you would have taken the money for your down payment and closing costs, and invested them instead of buying a home. At an appreciation rate of 2.05% every year, you would have only made about $4,000 over the course of 9 years. Instead, you made a whopping $40,871. Rent is always increasing. With a fixed-rate mortgage, you know what your monthly payments are going to be for the next 30 years, which allows you to better budget your money. Below is a graph depicting the rent increase alongside the steady house payment from our aforementioned scenario. Buying forces you to save money every month. Part of your mortgage payments each month goes to the principal balance of the loan. With each month, your equity increases helping you to build wealth. In short, buying a home in Omaha can save you a lot of money, along with plenty of other benefits. Are you thinking of taking the plunge into homeownership? If so, feel free to reach out to us at 402-991-5153. We’d love to take some time to go over your financial situation and see which mortgage will best fit your needs.